Adding another check to the California bucket-list, BOOM. This past weekend my boyfriend and I embarked on a mountain get away. Big Bear was everything plus some that we had envisioned it to be. Sharing travel tips and pictures below. Drive: Due to a full work day (#bills) we didn’t leave LA until late afternoon on Friday. Which could have possibly been the worst time to get on the road but that was our only option. What should have been roughly a two-hour drive took us close to 3 1/2 hours. With that being said, leaving earlier rather than later is key to starting off your trip stress free. PS: driving up the mountain in the night can be a little scary so please, pay extra attention. PSS: once entering the mountain service is pretty spotty so make sure that you have a set of back up directions as well an offline playlist. Lodging: We stayed at Noon Lodge which was the perfect boutique mountain getaway. We stayed in the studio cabin and truthfully, it was everything we needed. A quaint room with a comfortable bed, simplistic rustic mountain décor and a fire pit within 10 steps. With it being our first time to Big Bear we were not overly familiar with the area so we lucked out with the location of the cabin. We were a quick drive away from Big Bear Lake Village, the cutest shopping and entertainment district. Bites: By the time we finally arrived to Big Bear and got checked in and settled we were real hangry (when you are so hungry that your lack of food causes you to become angry, frustrated or both, so we threw on an extra layer of clothes and headed to Big Bear Lake Brewing Company. The vibe was on point and the staff would not have been nicer. We raised the local brewed beers and had a cheers for a fun weekend ahead. A MUST? The Avocado Bomb. Seriously, don’t even ask questions just order it and enjoy. Ok fine. I’ll tell you what it is – honey ale tempera battered avocado, spicy sashimi ahi, crab and shrimp cake, ponzu, chipotle aioli & wonton crisps aka heaven on a plate. My mouth is watering just thinking about them. Other restaurants recommendations = Teddy Bear or Lumberjack Café for breakfast. Both places serve big home cooking style portions. Don’t worry, calories don’t count on vacation ;) El Jacalito is a great spot to cure a Mexican food craving. The guacamole is super fresh and their margaritas are huge so it’s a win win. Activities: Besides trying to stay warm? Not much. KIDDING, that was the Florida girl in me speaking! Winter sports / activities are at every turn. We spent half a day at Snow Summit which is home to beautiful slopes for skiing and snowboarding (to each their own) and you better believe that the little kid in us came out when snow tubing at Magic Mountain Alpine Slide. It might sound silly, but we spent some time driving around and exploring neighborhoods. We would get out of the car every so often to go explore down by the lake and just so I could take 105 pictures of the snow covered trees. 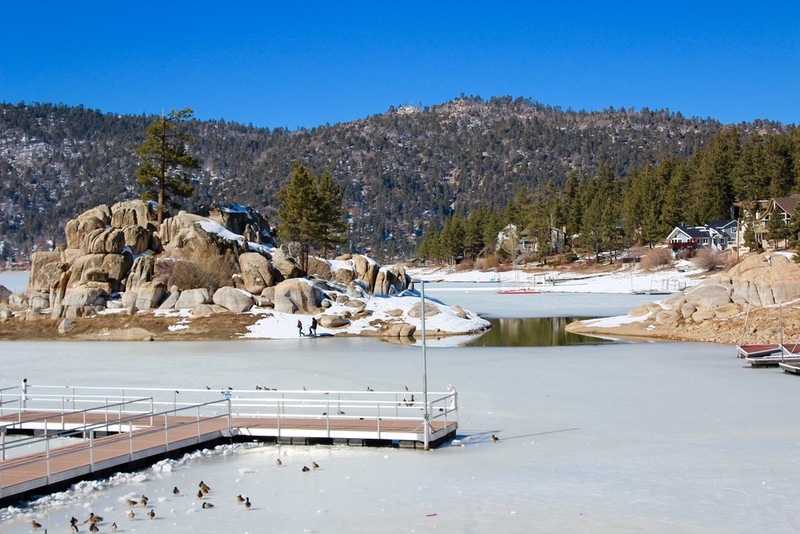 Planning to take a trip to Big Bear? I would love to hear about it! Been before? Please share your favorite part!